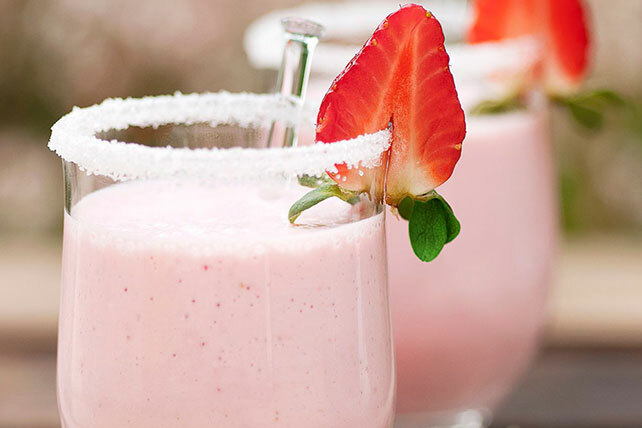 Creamy smoothies for two, coming right up! With the refreshing flavor of watermelon and strawberries, these drinks are like summer in a sugar-rimmed glass! Spread sugar onto small plate. Moisten rims of 2 glasses, then dip in sugar to evenly coat rims. Blend milk, ice, COOL WHIP, drink mix and 6 strawberries in blender until smooth. Pour into prepared glasses; garnish with remaining strawberry, cut in half. For a delicious alternative, prepare using your favorite flavor combination of fruit and KOOL-AID Liquid Flavor Drink Mix.